Wide, Wide, World of TomatoTown – Tomato Town organically grows heirloom tomatoes in the greater Kansas City area as well as Johnson County, Leawood, Lenexa, Olathe, Shawnee, Merriam KS, Independence MO and Kansas City Missouri, KCMO. Varieties include: Cherokee Purple, Brandywine, Stupice, Carbon, Black Krim, Black Cherry, Yellow Pear, Absinthe and Aunt Ruby’s German Green. 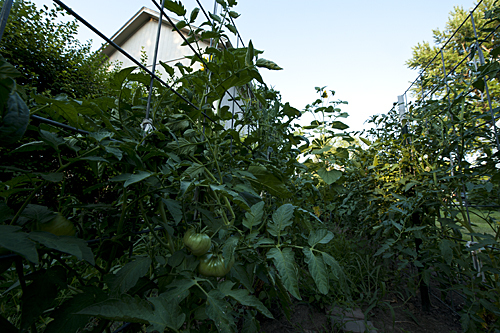 We’ve had requests for wider shots of the garden here at TomatoTown, so Farmer J left her trusty macro lens inside. 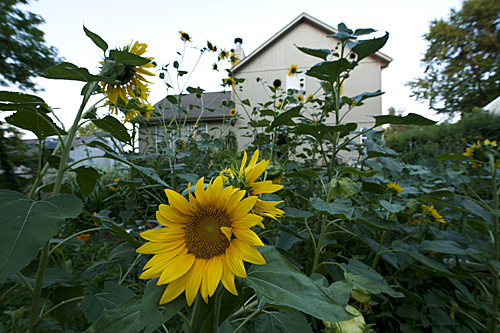 Our garden is a bit on the wild side, which is good for critters. We’ve been to manicured gardens, and we admire them. We just prefer to let nature take its course, for the most part. 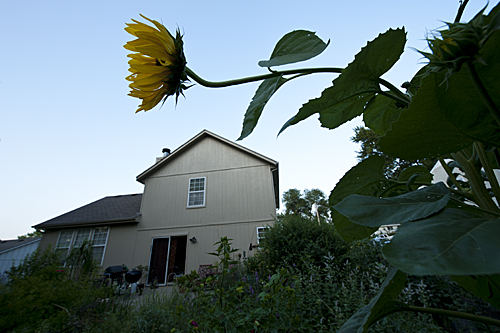 Most of the sunflowers you see in the photos below are from the bird feeders. Farmer T just mows around them during the Spring. We like them, the birds like them, however, we have to photograph them fast as they get snacked on rather quickly. So far, we’ve harvested three tomatoes, a Black Mauri, and two Early Girls. It is getting exciting around here! This entry was posted on Sunday, July 10th, 2011 at 7:51 pm. 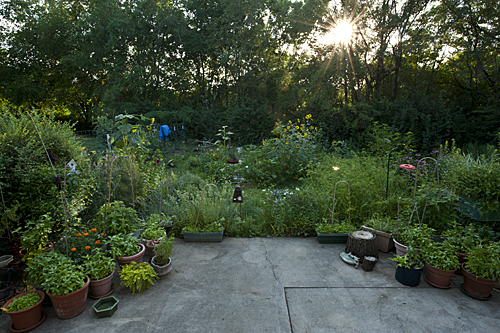 It is filed under Companion Plants, Garden Advice. You can follow any responses to this entry through the RSS 2.0 feed.